You know the recycling basics: paper, plastic and metal together in the cart; glass on the side. But some items just don’t seem to fit nicely in those categories. Recyclers count on us to send them clean materials so they can turn them back into new products. So getting it right is important. 1) Plastic numbers fallacy: “There is a number with a chasing arrow at the bottom so I put it in the recycling." Don’t worry about the numbers. Just think size and shape. Our materials are sorted by machines. These machines separate objects into basically two categories of shape: flat and not flat. Flat stuff goes to paper mills. Not flat items are considered containers. Small items fall through the machinery and end up in the wrong place. Size is 6 ounces or larger. Shaped like a margarine tub. Shaped like a flower pot. Size is 4 inches or larger. Size is 5 gallons or smaller. That’s all the plastic we want in the recycling cart. Actually, we would love to have those kind of tubs, too. The color of the container is not important. If it is the right size and shape, put it in the cart for recycling. Oops. The wishful recycler wants them to go in the recycling, but freezer boxes and coffee cups simply don’t belong. These paper products have plastic injected into the paper pulping process so they can hold their products, even in extreme temperatures and moisture. The plastic makes it hard to turn the paper back into another paper product. These two belong in the garbage. Recycling depots don’t want them either. The list says ‘no lids’ next to the plastics because plastic lids are flat and end up at the paper mill. But we actually like metal lids. A magnet can pull them out of the paper and send them to a steel mill. Unfortunately, one of the least informative places to look to determine where to put your container is on the label of the container. Packaging labels can be misleading, as there is no regulation that says that their claim to recyclability (or compostability) has to be true. Local recycling sorting processes and recycling markets are different all over the country so coming up with a universal label has not been achieved. Check the official accepted list in your local jurisdiction to see if the item you are wondering about is specifically named in the yes or no list. If it is not listed, it is likely not accepted. Your recycling roll cart may have a list printed on it or your garbage and recycling company can provide the list. WHEN IN DOUBT, THROW IT OUT. 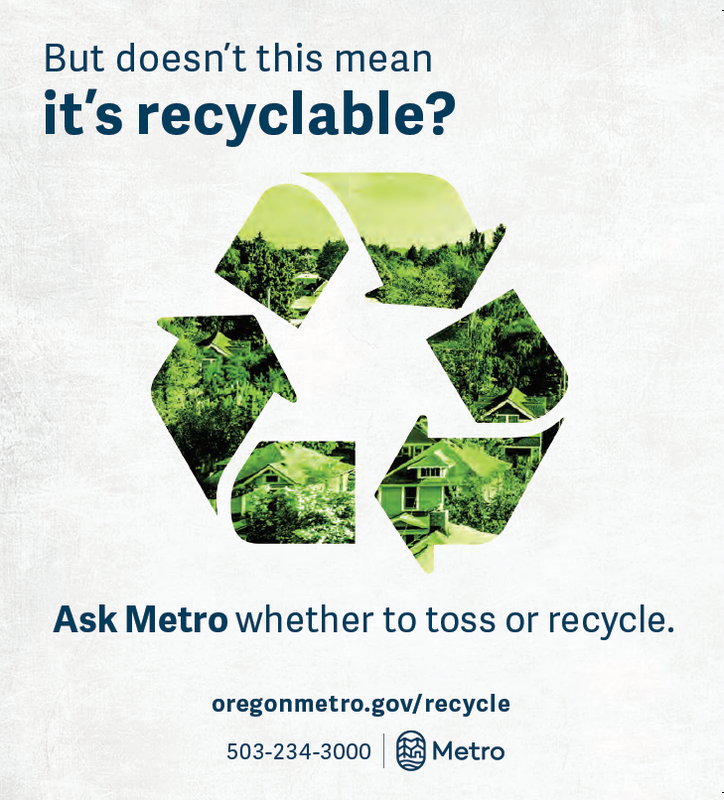 Or Ask Metro, 503-234-3000. Newer PostMake the Most of Your Food Scraps!